1. I love that Dave has a big family (8 siblings, all of whom have kids and grandkids of their own, and his 3 children & 4 grandchildren)! Coming from a small family (just my brother and me, my Dad was an only child, my Mom wasn’t close to her brothers or aunts & uncles), it’s fun. And the most amazing thing to me is that they all get along so well! They might not see each other every day or even all that often, but when they do, there’s no bickering or jealousy…just fun and talk. I LOVE that! 2. I went clothes shopping with Dave’s youngest sister last night. She’s close to my age and this was the first time we had done anything just the two of us. We had fun, but OMG! My stoma was making SO much noise! I explained to her what was going on and she just shrugged and said, that’s life. Made me feel more comfortable. 3. I’m content. Been a long time, if ever, that I’ve felt like that. I feel that I’m finally where I’m supposed to be. 4. The relationship that Dave and I have is amazing. We’re happy with the way things are. We don’t need material things to make us any more happy…a long car ride is all we need, and barring that…a walk. Motion is good for us! 5. While I’m far from rich, I’m at a place where I’m comfortable. I don’t have to live paycheck to paycheck anymore. That’s a great feeling! 6. Lately, I’ve been able to stop biting my nails. No desire. Of course, keeping polish on them helps! 7. My bed. It’s SO comfortable!!! It’s my absolute favorite piece of furniture in the house. 8. I love that I’m slowly but surely letting go of material possessions. I had such a stockpile of perfumes and lotions…and lately, I’ve been bringing some to work. It’s fun to give to a co-worker and watch her face light up! 9. I love my iPhone and iPad. The iPad makes it so amazingly easy to consolidate all my books…to play a game with friends I don’t get a chance to see as much as I’d like…to view pictures…to kill those darn pigs! The iPhone, since it’s always with me, has taken over as my favorite photography tool. 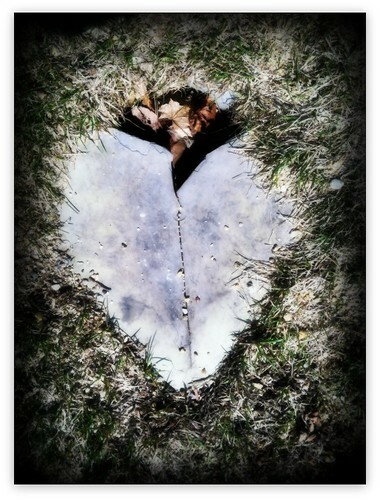 I recently downloaded Camera+ and I love it! Makes it so easy to edit pictures and save or upload to various places online. 10. I love this summer. It’s been utterly amazing so far! I spent more time down the Cape (Cape Cod to you non-Massholes) than I have since summers as a child. I’ve spent time up the mountains, seen a family of foxes, reconnected with a high school friend I hadn’t seen since high school, posted and read funny, entertaining and/or meaningful things on Facebook, saw a bunch of concerts and found a Popeye’s not too far away. Love!!! 11. I was thrilled that the last Harry Potter movie was so damn good! Finally, Snape explained. They did a fantastic job of it! 12. I love that I’m back at WW (I mean, hell, I’d love to NOT need WW and to be slender and willowly, but heck, that’s not gonna happen). It’s slow going…I started the last day of April and have lost about 15 pounds so far. Most weeks, I lost but a few I gained and I missed two weigh ins altogether (even tho I was able to find meetings down the Cape, in CT and in NYC on trips). Still, I fall down and pick myself right back up. Once I get to 30 pounds Dave has to quit smoking and I can’t WAIT for that day! 13. 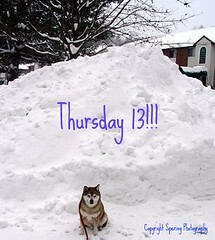 Ahhh…13. 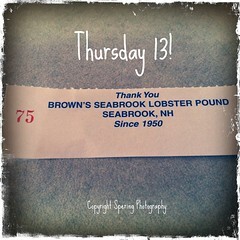 Lucky number for me. For 13, I’m just going to share a recent picture I love. Oh yeah, right, just one? Um…here’s three, and I’m going to stop looking now. 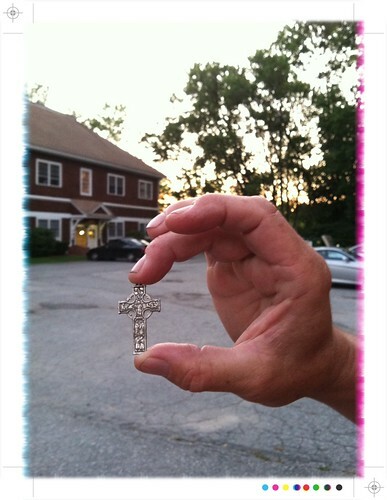 Dave and I took a walk and I spotted this cross laying in the road. I didn’t stop to pick it up (SO unlike me), but I mentioned it to Dave after we passed it. HE went back to pick it up and slipped it into his wallet. Soon thereafter, we were at Foxwoods casino for a concert and were entertaining ourselves playing slots for a bit. He took out his wallet to give me his Foxwoods card, and the cross must’ve slipped out without either of us noticing. Apparently, someone at the casino needed to find a lost cross, and I hope it helped them! I saw this sign down in Falmouth, MA recently and since I’m working on uncluttering my life, I didn’t buy it. But I DID have to snap a picture…that’s me! 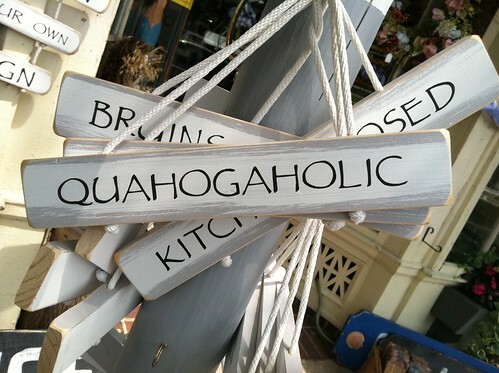 I’m a quahogaholic! 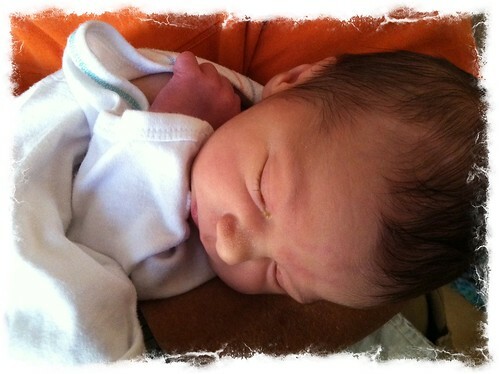 Dave’s newest grandson, asleep in his arms, a very comfortable place to be! 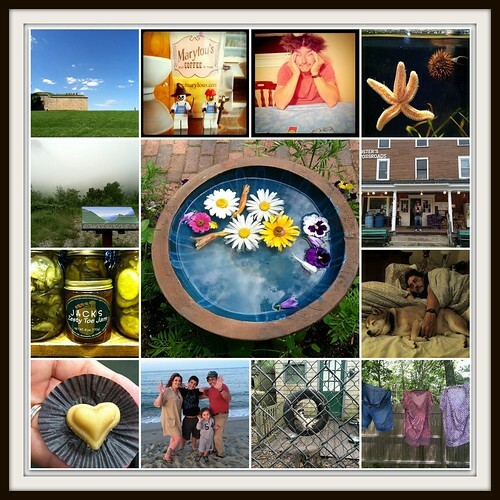 13 recent photos I love! Since I got an iPhone in February, I’ve barely used my cameras. I’ll get back to them, I’m sure…but in the meantime, this is what has caught my eye. Come play along at the Thursday-13 Hq! 1. I am thinking…how much my arms ache from the gym. 2. I am thankful for…being able to GO to the gym! 6. I am going…to Cape Cod for a week’s vacation this year and back again for 3 more days after that. 8. I am hoping…that it warms up soon (also, it would be nice to skip over mud season and please, let’s have all the ticks die of a mysterious illness affecting ONLY ticks). 9. I am hearing…a hum from the computer and the keys as I type this…pretty quiet otherwise. 10. Around the house…is some clutter…I’ve got a few boxes to go over to a friends for storage and a few boxes to fill with things for donation. 11. One of my favorite things…is sleep, which I seem to be sorely lacking lately. 12. A few plans for the rest of the week…date night on Friday, the gym and a baby shower Saturday and Sunday a Disco Brunch with Michelle! 1. I am thinking…I should get going, take the dogs out, and go to work! 2. I am thankful for…getting a cancer-free thumbs up diagnosis after my one year check up on Monday! 5. I am creating…pictures of things I see, things that catch my eye. 6. I am going…to get an iPhone 2/10/11! 8. I am hoping…that it doesn’t snow too much more this season. 9. I am hearing…the tv in the living room…doom and gloom, as always. I just put it on to see if the snow that’s falling is going to accumulate. 10. Around the house…love and laughter, comfy furniture, neatness (NOT!!! ), good food. 11. One of my favorite things…is a warm summer’s day at the beach! 12. A few plans for the rest of the week…if the snow isn’t bad Saturday, we’re going to pick up Dave’s grandson and go to the local WInter Festival. Sunday, no plans, just relaxing.. I put some old dog bones (see the red bone in the snow?) out for the squirrel and of course Wolf smelled it up there…it’s a toss up between how much he wants that bone and how much he wants the squirrel (who was taunting him this morning). 1. I am thinking…that I really need to control my eating! 2. I am thankful for…life, for Facebook, for being able to look at the positive side of things. 3. From the kitchen…yesterday I made the most amazing macaroni and cheese! 5. I am creating…a life with Dave…and it’s pretty amazing, this whole thing. 6. I am going…to be leaving work soon! 9. I am hearing…nothing; it’s blessed quiet right now. 10. Around the house…is lots of shiba hair, even though I’ve been vacuuming more often. 11. One of my favorite things…is that first cup of coffee in the morning! 12. 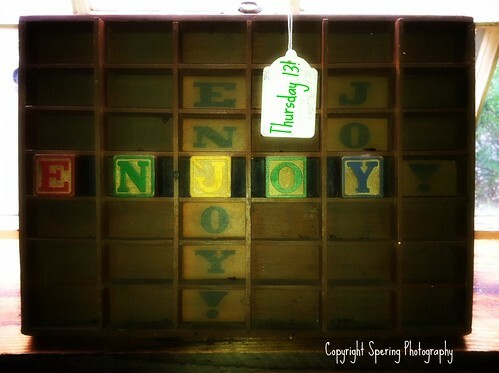 A few plans for the rest of the week…nothing set in stone…and I like it that way! Maybe Dave, the dogs and I will take a walk in the woods through the snow…maybe we’ll visit my cousin…maybe we’ll get the blu-ray DVD hooked up…maybe we’ll kiss the weekend away. 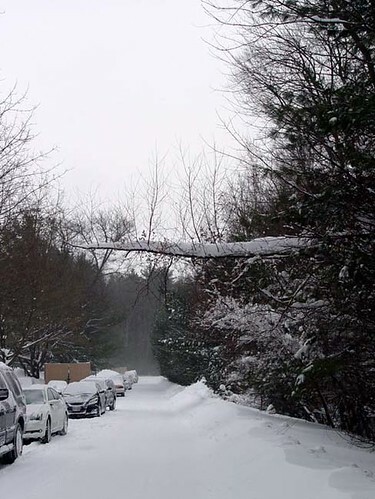 I loved how the snow piled up on that one branch that stretched over the road!